Current Facebook Status: has lots to do and still no motivation to do it. Where’s the chocolate? I was going to post this last night but was distracted by a phone call [I’ll mention the topic later this week; let’s just say it was bad news and leave it at that for now]. That took up a fair bit of the rest of the evening so this is getting posted today. Next week will be Erynn Mangum week! I got my influencer’s copy of Double Shot so… All six of Erynn’s books will be reviewed! Wish I had like a giveaway or something to go with it but since I have like four readers*, and I know all of them, that would be kind of pointless anyway ;). Maybe by this time next year! This is the third [and final?] 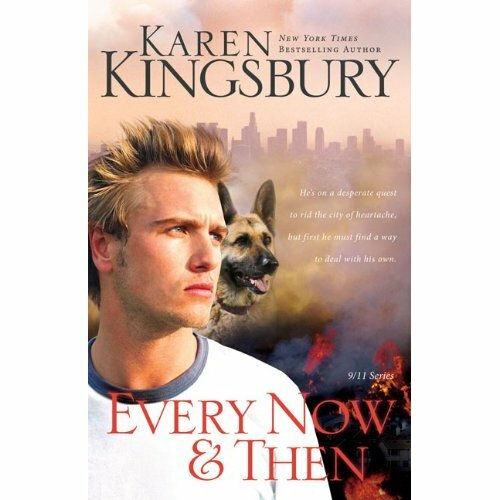 book in Kingsbury’s 9/11 series. The first two are One Tuesday Morning and Beyond Tuesday Morning. Unlike the other two, this one takes place solely in California, about three or four years after book 2. A wall went up around Alex Brady’s heart when his father, a New York firefighter, died in the Twin Towers. Turning his back on the only woman he ever loved, Alex shut out all the people who cared about him to concentrate on fighting crime. He and his trusty K9 partner, Bo, are determined to eliminate evil in the world and prevent tragedies like 9-11. Then the worst fire season in California’s history erupts, and Alex faces the ultimate challenge to protect the community he serves. An environmental terrorist group is targeting the plush Oak Canyon Estates. At the risk of losing his job, and his soul, Alex is determined to infiltrate the group and put an end to their corruption. Only the friendship of Clay and Jamie Michaels—and the love of a dedicated young woman—can help Alex drop the walls around his heart and move forward into the future God has for him. I liked the characters. That wasn’t my problem with the other two books. I liked the characters but I thought the plot, especially in the first one, left something to be desired. I love seeing Jamie and Clay and their family and what’s happened to them. Same with Eric and Laura. I enjoyed getting to know both Alex and Holly. I was glad to get away from the 9/11 stuff to an extent – that’s odd because I’m still enthralled with it. I think it has more to do with this series than 9/11 itself. Alex as a K-9 guy and his investigation. Nothing in particular in this one either. I think this is the best in the series. I don’t know if she’s planning on more or not [I’m thinking not], but I think getting further away from the relative absurdity of the plot in the first one has helped quite a bit. I like the characters and their lives, but not crazy about the plot of the first one so getting away from it – something like seven years removed at this point – has helped a lot. Despite the rating, I probably won’t buy it just because it’s book 3 of a series and I’m more likely to just get it from the library. *To be fair, I’ve noticed a spike in hits recently – probably due to assorted website based discussions on the ACFW loop. So if there’s more than four of you… YAY!